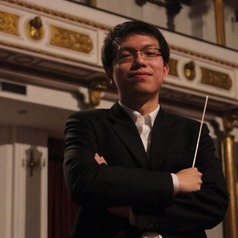 Michael Mulyadi is one of the most active young conductors in Indonesia who now leads two university orchestras: Orkes Simfoni Universitas Indonesia ‘Mahawaditra’ and Universitas Pelita Harapan Symphony Orchestra as music director and conductor for both orchestras. With OSUI ‘Mahawaditra’, he performed in Sydney Opera House and Sydney Town Hall in July 2015. Serving as resident conductor of Eliata Choir and Chamber Orchestra since 2008, Michael in his budding career has conducted Jakarta City Philharmonic, Berlin Sinfonietta, Nusantara Symphony Orchestra, Gloriamus Philharmonia, Twilite Youth Orchestra, Pemusik Sayembara Komposisi Musik Baru Salihara, Musicorum Society Orchestra, Celeste Chamber Orchestra and other orchestras in Jakarta. Michael started his musical education when he was 5 and studied piano in Yayasan Pendidikan Musik and graduated from its piano pre-conservatory programme under the tuition of Caroline Lukito and later Aisha Ariadna Pletscher. After studying the basics of singing with Renata Lim, he initially started his choir conducting career at the age of 15. He then studied both choral and orchestral conducting under the tutelage of Budi Utomo Prabowo in 2008 and since then has been selected and participated in conducting masterclasses by Prof. Colin Metters (UK), Prof. Sigmund Thorp (Norway), Prof. Christian Ehwald (Germany), Peter Henke (Denmark), Dr. Miguel Felipe (USA), and Mark Heron (UK). He got the opportunity to study orchestral conducting in Sherborne, with Rudolfo Saglimbeni (Venezuela), Robert Houlihan (Ireland), Toby Purser (UK) and conducting pedagogue Denise Ham (UK). In 2007, Michael established an online music magazine A Musical Promenade (musicalprom.com) and serves as its editor-in-chief while building public interest in art music with the support of 30 different contributors. He taught Music History subject in Sekolah Musik Yayasan Pendidikan Musik in 2012-2015. With a first degree in computer science from University of Indonesia, Michael previously worked as a sales specialist and product marketing manager in IBM Corporation before he decided to further his studies and graduated with distinction in Arts Administration and Cultural Policy postgraduate programme in Goldsmiths, University of London. Michael now serves as administration and management consultant for Sekolah Musik Musicorum, lecturer in Universitas Pelita Harapan and national assesor for Creative Economy Agency (Badan Ekonomi Kreatif) Republic of Indonesia.